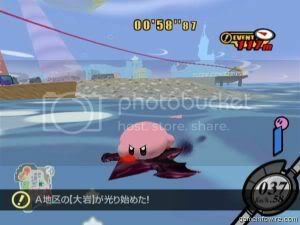 Gamecube Online - View topic - All about Kirby Air Ride! 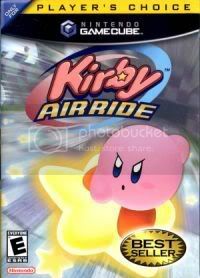 Topic: All about Kirby Air Ride! I orinigally was going to put this in a responce to a question nikon asked in another topic, but i thought that after all the time I put into this it needed its own topic. 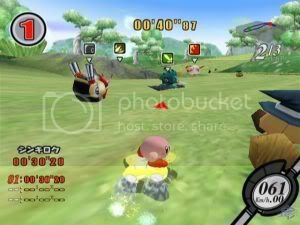 Here you go, Nikon you wanted to know of all the modes in kirby well here is a nicely done article I have written up as I am obsessed with this game! Here is the cover for anyone interested, though there are two different covers as the game has now gone player's choice, but with either cover the game will still only cost you $20 USD. Push "A" to break, hold it to charge a boost. Also use it to inhale enemies/use powerups. 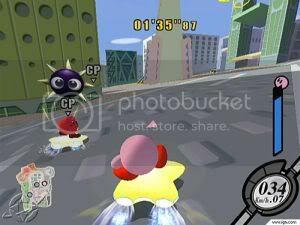 When you find a boost pad push A to launch you. ---Though as simple as this sounds, the game has alot to it. 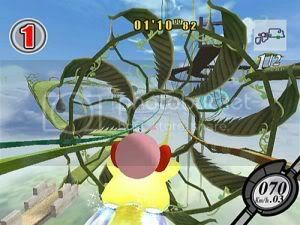 There are of course three different game modes: Air Ride, Top Ride, and City Trial. 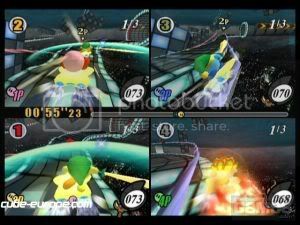 This is the standard race mode. 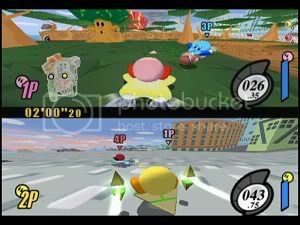 In it four kirbys go head to head in a battle based on speed and skill. 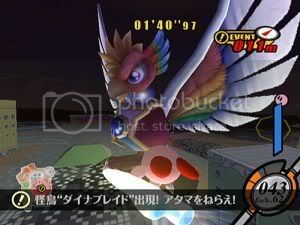 There are a total of nine levels to choose from which include. By default the races are set to 2 laps, but its always alot more fun to increase it if you are playing multiplayer(espically if its LAN). 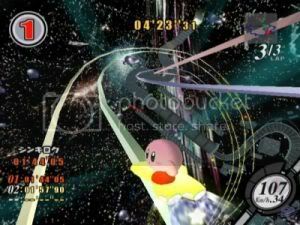 Though Damage is set off by default and I HIGHLY reccomend turning it on as there is no point to attacking your foes if you cannot destory the star upon which they ride. If you dont have damage on all your attacks will do is most likely launch them forward. 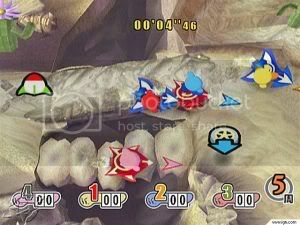 At the begining of each match you chooose the air ride machines(stars) upon which you will ride. When you first begin the game you will not have much of a choice of your star, but as you progress you will begin to unlock many more. 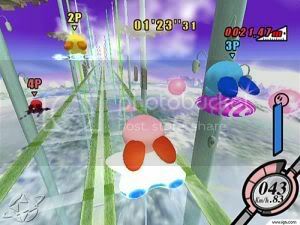 As you race through the levels you can inhale many enemies that inhabit the tracks. 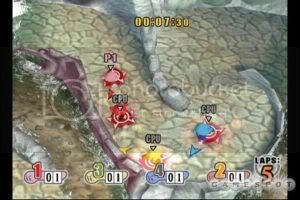 You gain familiar powerups to use againts your friends/bots to help you win. Though one flaw I have found is that when racing with the AI alot of the time it doesnt feel like you are racing at all, just making your way through the level. Here are a few screenshots from this mode of play. Top ride is the only mode of the game that is not available in LAN play. This is of course due to the fact that it is played on one screen with a overhead view. This would actully be a really good idea for control sim! This game type mimics the old Arcade overhead racers. 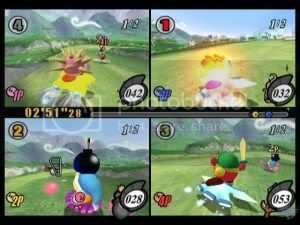 There is no Copy abilities availabe in Top Ride Mode,Instead you gain powerups using items that appear randomly on the course. These powerups are some of the same that appear in Air Ride, others are new ones that are quite interesting. There are also little Air Rails that will appear randomly and make short cuts across the map. 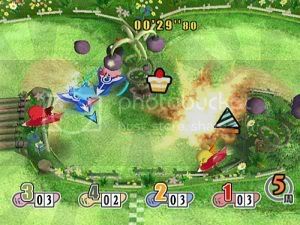 these games can range from 1 lap to 99. as 99 is a bit extensive, lol, you can do some pretty long matches which make for a great party game. 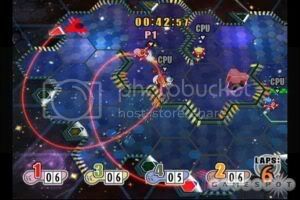 There are only two different "stars" you can use in this mode, each star makes the controls different for the player. Air Ride Mode. It's also used for using certain items. 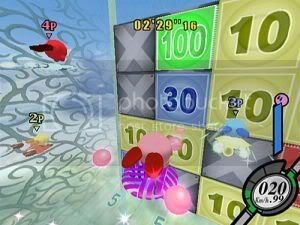 and finally my personal favorite game mode of all! This is what LAN is all about in this game! City Trial is an action packed event in which you explore the city and collect items to enhance your machine. 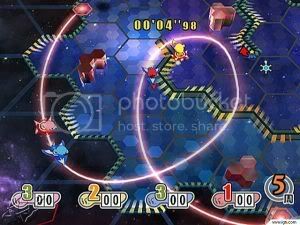 After time runs out, you compete with your machine(star) against others! 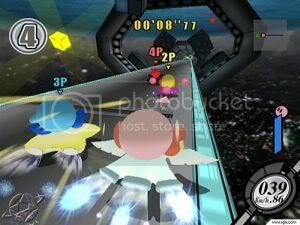 The controls are the same as those present in Air Ride mode, except that you can jump off your machine and run around till you find a new one by pressing and holding "back" on the control stick and "A"
You begin the match on the most basic and pathetic machine of all, the Compact Star. This machine is slow, has terrible flight and cannot take a beating at all. 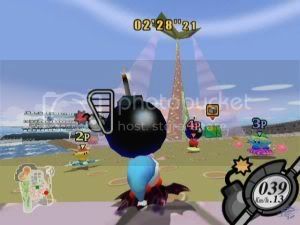 As soon as you begin the match your best bet is to jump off this star and find a new one. You can see the icons of stars that are farther away when you are not currently on one. 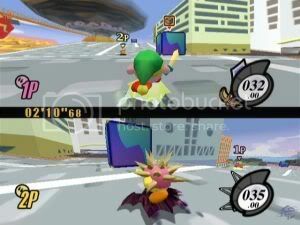 As you race around the city you collect many items to increase the top speed, flight, attack power, defensive power, handling, and accelleration. 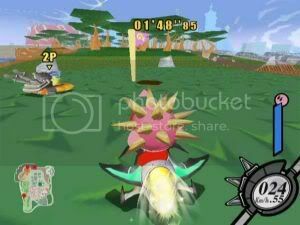 All the powerups that are available in the Air ride are also present. You break open boxes to gain these powerups in an attempt to destory your opponents. Once you destory the machine an opponent is on tehy drop a percentage of their items and must run to a new machine to pick them up. The time limit can go up to 7 mins. Many events go on in the city that hinder your chances of survival. 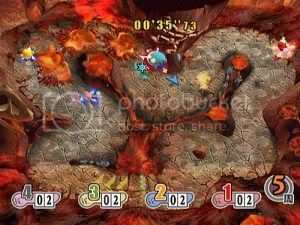 Such events are a meteor attack, the air ride machines are forced to go at blazing speeds, tac steals all the items and you must find him to get them back, and the rail stations will all catch fire, along with many more. Whoever wins this event is the winner of the match. Some matches have more than one round. How well you do in these depend on how you built your machine. 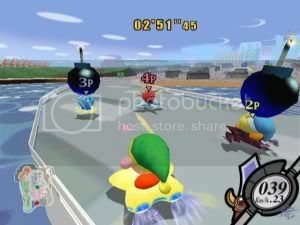 For example Top speed is best for drag draces, and flight is best for high jump. and thats about it. wow this took awhile. But i hope you find this usefull and interesting! Now go out and get this game, I assure you that you will not regret it! With LAN play, and hundreds of unlockables. 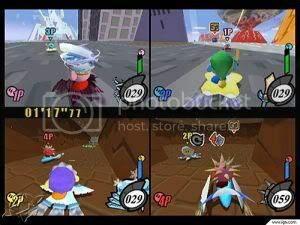 This is a multiplayer expierence like no other. Wow!! I bet LAN play is a LOT of fun! w00t my friends from back in high school are coming home nov 11th. 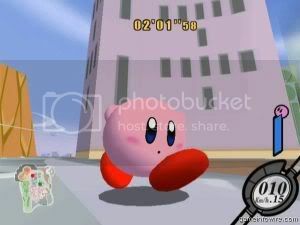 im gonna organize some people together from my campus as well and try to have a big LAN party with of course kirby included. I am gonna have to introduce GC LAN games to alot of people. Though I wish we had a place that we could stay in for the night as the townhouse we normally used is now sort of out of the question now. any suggestions of some place that can be used for an all night LAN event? 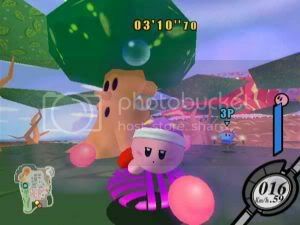 I am sooo looking forward to playing kirby on LAN again! Proud new gamecube owner and now I got quite a few gems in my collection . 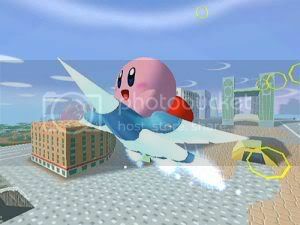 Kibry AirRide is one amazing racing game. The best mode in my opinion is by far City Trial. (I'm not sure if this is on LAN though.) Last spring when I got this, my siblings and I were playing an awful lot of City Trial, though I liked it more than my brother did. Simple controls, but as usual it takes skill to play it well. If I ever find a cheap BBA, we're tunnelling this immediately. Yea the only one that is not in LAN is top ride. 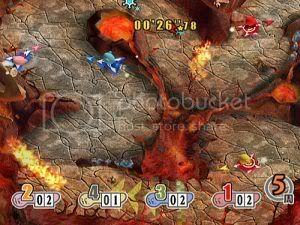 I would love to try xlink to play this online with you. As this game with my friend and I seems to be lagtacular. Let me know if you ever get a BBA so we can see whats its like. 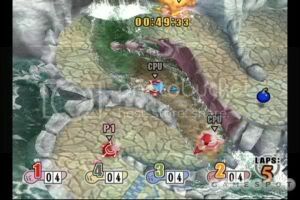 I hate the King Deedede challenge, hate it so much.